This post on the top 10 corner electric fireplaces was brought about by a friend of mine who stated he would like an electric fireplace but he didn’t have any room. I was staring right at a corner in his apartment was not being used. My insatiable curiosity got the best of me in this post was born. We tried to select different styles and functions for you to browse through. We hope you find a favorite. ✅ You might want to quickly check the price (by clicking here) The different finishes are priced differently and often on sale. Sometimes the Espresso finish (with infrared heat) is actually cheaper than the Mission Oak finish with regular heat. If so, you’ll get a real BARGAIN. The Cartwright corner electric fireplace is from Southern Enterprises Inc. and is available in 2 finishes. The Espresso finish model is dark and uses infrared heat. This will heat a larger area than the Mission Oak finish model which utilizes regular forced air heat. The arched faux slate surround is extremely realistic. Some people have to actually touch it to see if it is real slate. Like most firebox light effects used by Southern Enterprises, it is going for the realistic looking flame effect of a real fire. There are no fancy colors or psychedelic light shows. The flame effects are really good. The flames can operate independently of the heater. There is no need for the heater to be operational at the same time as the flame effects. We have written a full and comprehensive review on this convertible electric fireplace. Click:✅ Cartwright Corner Electric Fireplace Review. 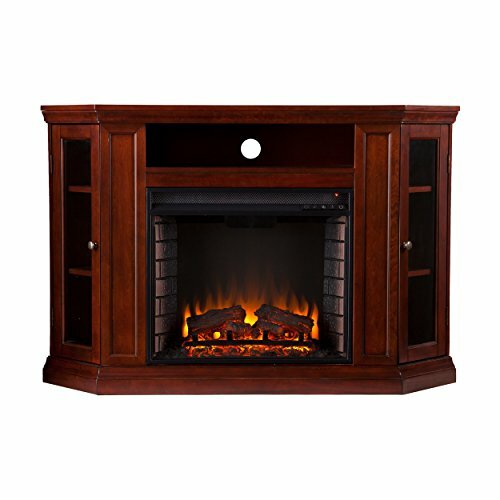 This ClassicFlame corner electric fireplace is usually sold without the firebox. 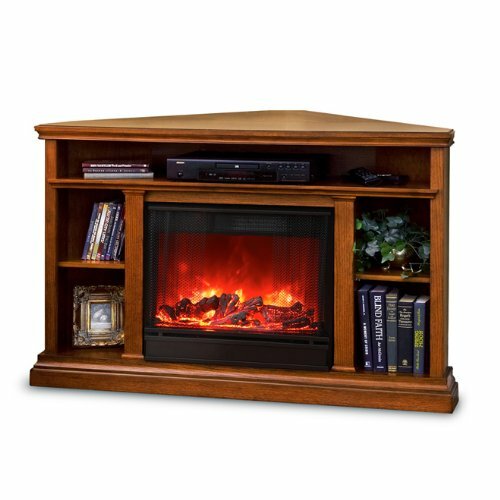 We found a version that includes a ✅ Corner Electric Fireplace TV Stand With An Infrared Heater Box. Like most fireboxes used by Southern Enterprises, it is going for the realistic looking flame effect of a real fire. There are no fancy colors or psychedelic light shows. The flames operate independently of the heater. There is no need for the heater to be operational at the same time as the flame effects. ClassicFlame is one of our top 4 recommended brands. The strength of this corner convertible electric fireplace we particularly like is the ‘Spectrafire Plus’ flame effects. It uses Using all LED lighting, and the patented technology lets you choose from 5 flame colors, 5 flame brightness levels & 5 flame speeds for endless customization. If you want to have endless options to generate coziness and ambiance, this fireplace can’t be beat. If that was not enough, the firebox uses infrared heat, which boosts heating capacity from 400 sq, ft. to 1,000 sq. ft. It has over heat protection. (Click too learn more about infrared heat electric fireplaces). This puppy is designed to be a beautiful room focal point. The intensity of the flickering flames and the burning embers can be adjusted with the infrared remote control to five levels. Energy efficient LED’s are used for the flame effects and these will last for a long time so there should be no need to replace them. The Windsor corner electric fireplace with infrared heat is another entry from ClassicFlame. Again, ClassicFlame is one of four electric fireplace makers we feel REALLY comfortably about recommending. Their strength is in the flame effects produced. This model features the patented ‘SpectraFire Flame Technology’. It produces a very realistic flame effect. However, it has a ton of color customization options if you want to jazz it up a bit. The beautiful firebox features LED lighting and a glowing log set for ultimate realism. ✅ They should call this fireplace ‘Mr. Versatile’, It converts quickly from corner to flat wall application, OR it can be assembled as a traditional electric fireplace mantel OR an Electric fireplace TV stand and media center. You can quickly check the price and read more reviews by clicking here) . 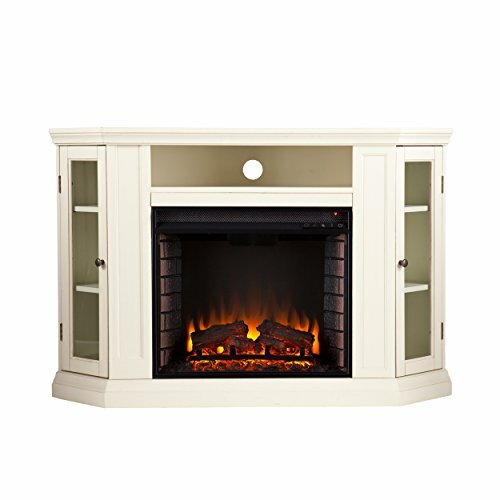 This White Corner Electric Fireplace is from Dimplex, one of the top 4 electric fireplace makers we recommend. The Colleen is a convertible electric fireplace, so it can be placed in a corner or flat against a wall. Another cool feature is that there is a panel included you can install upon assembly to close off the media space and have a flat front with no shelf. So you can use this as an electric fireplace media center (panel off), or as a traditional electric fireplace mantel, (panel on). It has realistic, handcrafted logs, patented prism flame effects technology and pulsing, glowing embers for even more realism. It uses a standard 3 pronged household electrical outlet. The remote is full function. 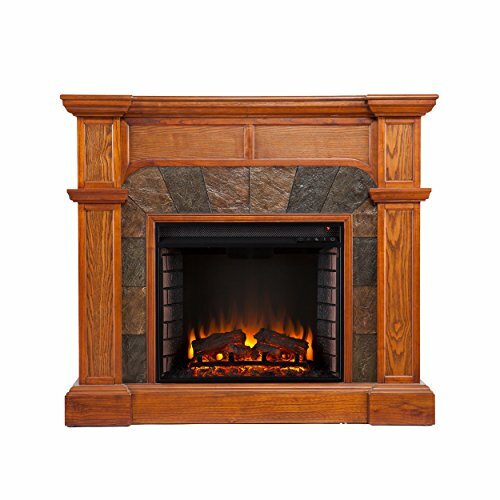 ✅ You might want to quickly check the price (by clicking here) This may be more expensive than some of the other fireplaces we have listed. BUT, as we all know the prices can go up or down in a snap. We would rather You check today’s price rather than post info that could quickly be out dated. This Dimplex Ebony And White Convertible Corner Electric Fireplace is pretty unique among our 10 selected corner fireplaces. It is, arguably the only one that is truly contemporary and modern in terms of decor. It uses a fashion forward, contemporary color scheme of black on white. The transition between front facing surfaces are either mitered or stepped for a clean look. Dimplex fireplace logs are hand crafted and molded from real wood logs, offering an incredibly realistic log set. The flame effects are good, going for the “realistic” flame effects. Dimplex’s patented LED inner glow logs and pulsating ember technology allow the logs and embers to glow increasing the realism. The firebox’s heating capacity is the standard 400 ft.² and provide supplemental heating. As with virtually all electric fireplaces the front face stays cool. ✅ You might want to quickly check the price (by clicking here) for today’s sale price. We used our price checker app and noted that this fireplace has had 6 price changes in a month. In other words it goes on sale often. You can get get a real BARGAIN. This is a stunning white corner electric fireplace by our friends at Southern Enterprises. We really like the look of this fireplace. It features angled side compartments which are great for holding DVDs or might even be used for bookshelves. As shown in the picture there is a shelf immediately above the fireplace that can accommodate your cable box and DVD player. This convertible electric fireplace can accommodate up to a 50 inch flat-screen TV on top. The mantle designed and rated to support 85 pounds. The firebox is the Southern Enterprises standard which produces supplemental heat for up to 400 ft.² which is the standard amount of heat for non-infrared fireplaces. The flame effects are really nice and adjustable for brightness. They go for the realistic effect. ✅ You might want to quickly check the price (by clicking here) It comes in 2 different finishes. When that happens the prices are almost always different. One often on sale. Sometimes the Mahogany finish is substantially cheaper than the Warm Buttercream finish. These unusual and unique fireplace towers are by Southern Enterprises one of our recommended top four electric fireplace makers. It certainly is different from most corner electric fireplaces. It is, in fact, a corner electric fireplace and is built to support up to 85 pounds on top. It takes up less space than other fireplaces on our list. Click for more info to get the exact dimensions and weight of the unit. The firebox is the Southern Enterprises standard which produces supplemental heat for up to 400 ft.² The flame effects are really nice and adjustable for brightness. They go for the realistic effect. It features lifelike multi-color flames and burning logs with embers; the embers effect pulsates dimmer to brighter for an authentic look. ✅ You might want to quickly check the price (by clicking here) These are infrared electric fireplaces. The different finishes are priced differently and often on sale. Sometimes the Espresso finish is cheaper than the White finish. Regardless, you’ll get a real BARGAIN. Here are 2 more fine fireplaces by Southern Enterprises. We love the fashionable stacked stone detailing around the firebox. This creates a nice visual break from the angled side compartments, and makes it a room focal point. The cabinets have LED lighting inside them and can accommodate knickknacks or DVDs. These are infrared heat corner electric fireplaces. Therefore, the heating capacity is greatly increased from the standard 400 ft.² to 1000 ft.². Infrared heat maintains humidity for better warmth. The Grantham corner electric fireplace is another by Southern Enterprises one of our recommended top four electric fireplace makers. ✅ You might want to quickly check the price (by clicking here) The different finishes are priced differently and often on sale. Sometimes the White finish is actually cheaper than the Dark Walnut or Espresso finish. If so, you’ll get a real BARGAIN. 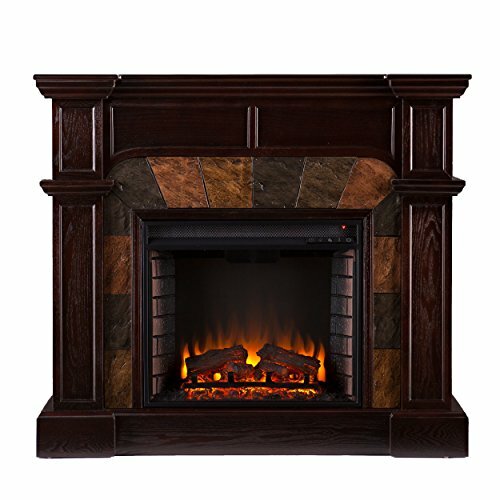 The Chateau small corner electric fireplace is the only entry from our recommended make Real Flame. We located 3 finishes, white, dark walnut and espresso, (don’t get confused, the espresso is actually light brown) ,pictured above. 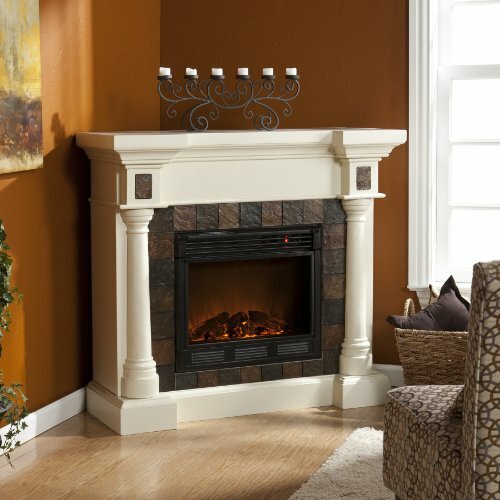 This corner electric fireplace is primarily an electric fireplace mantle. There is no provision for a DVD or cable box. It is not really designed to be an electric fireplace TV stand, though a TV could be placed on top. White electric fireplaces are one of the most sought after. Many of the fireplaces on our top ten list have a white finish option. Here are a few that did not make the list. We hope you enjoyed browsing through our list of the top 10 corner electric fireplaces. Our purpose in doing this post was to expose you to the many different styles of fireplace available. There truly is a fireplace that will exactly fit or reshape your room’s decor. At the same time you will benefit by getting some supplemental heat and creating cozy ambience. After all there is nothing better than getting cozy by the fire. 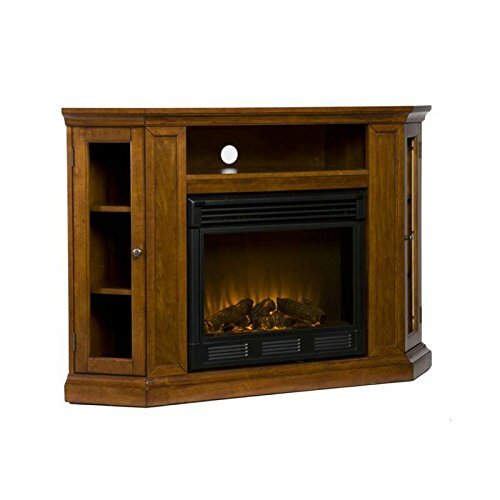 A lot of people have 2 different needs when looking for an electric fireplace TV media center. Some will put more emphasis on the unit as a piece of furniture, wanting a piece that will match their decor. Some will put more emphasis on the ability of the fireplace to generate a cozy mood, set a stage and create ambiance. Everyone’s emphasis is a little different. Ask yourself what is most important to you. 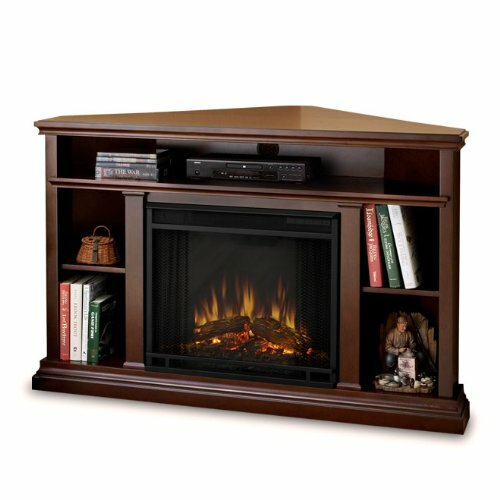 We have selected five different corner electric fireplace entertainment centers for your consideration. We have done comprehensive reviews on two of them. Hopefully these will meet your needs and give you ideas of what is available. The others of been selected on the basis of style, popularity, and feedback from actual buyer’s. We presented them so that you could see the different styles available. We selected some of the most commonly sought after electric fireplaces such as the white electric fireplace entertainment center and oak electric fireplace entertainment center. 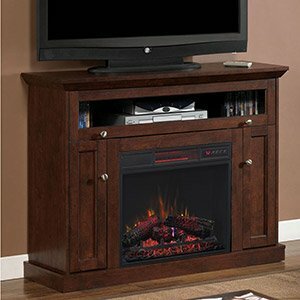 Click this link if you want to take a quick scan of all available corner electric fireplace entertainment centers. First off, let’s get clear on what a corner or convertible electric fireplace actually is. It is relatively simple. The electric fireplace media center has a triangular hinged flap on the back of it. It is very similar to a drop leaf table. When this triangular flap is extended and locked in place the top surface of the electric fireplace console will fit snugly into a corner against the walls. Since this flap, when not extended, sits flush with the back of the fireplace, The fireplace can also be placed against the wall and not necessarily in the corner. The “convertible” that you may see in some descriptions refers to the fact that the flap can be raised or left lowered and therefore the fireplace can be’ converted’ either flush in a corner or flush against a flat wall. 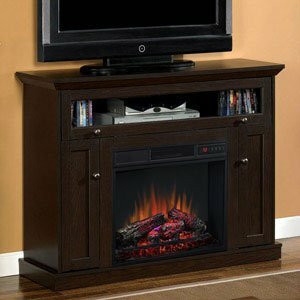 Now, let’s take a look at some corner electric fireplace entertainment centers. 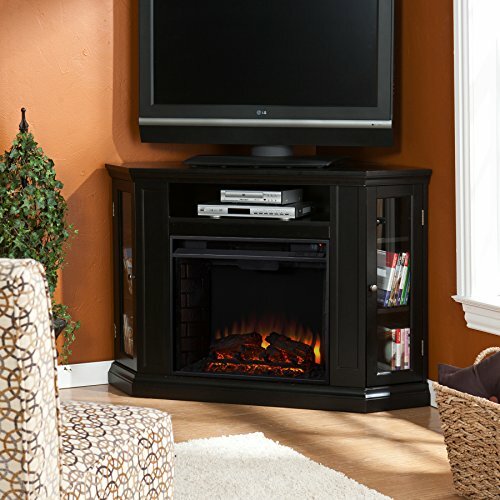 As illustrated below the Claremont convertible electric fireplace entertainment center is available in four different finishes, black, white, cherry, and mahogany. We have done a full, comprehensive review on this electric fireplace. This fireplace / media unit has the collapsible panel which will allow you to place the unit against a flat wall or a corner (hence the ‘convertible’). The unit will accommodate a TV of up to 46 inches in width and it can support up to 85 pounds in weight. The flames are multi colored and the intensity and ambience created can be adjusted. There is no need to have the heater working to enjoy the flame effects of this fireplace. The heater function can be off while the flames are on. The flames and fire effects are all powered by energy efficient LED’s that provide crisp effects. The heater uses a standard 120 volt electrical outlet for power and it is supplied with a 6 feet long electrical cord. The maximum output of the heater is 5000 BTU’s at 1500 watts with 12.5 amp consumption. Looking at the total number of buyer reviews, 69% flat out awarded the fireplace 5 out of five stars with a further 20% awarding a four out of five star rating. This is a very good combined total of 89% for a 4 to 5 star review, which is very good. The unit is manufactured by SEI – Southern Enterprise Inc, which is primarily a furniture maker. That furniture aspect is reflected in how good looking this unit is. This fireplace would make a great addition to any room. The Cartwright corner electric fireplace is currently available in 2 finishes – a mission oak and espresso. Originally there were 4 finishes available 2 of which were discontinued. The SEI Cartwright Fireplace shares the same fire box as the previously reviewed Claremont model. You get very nice flame effects.The flame effect is pretty realistic looking, and both the flames and the burning embers are adjustable. There are even five levels of brightness for the realistic looking flickering flames and burning logs. The heater fan is quiet in operation and the maximum heat output is 5000 BTU’s or 1500 Watts. The fireplace is designed to provide supplemental heat to a room of a maximum of 400 square feet in size. It has good heat output that can be precisely controlled. The design of the fireplace is first class and the panels look really good. You can use it to support your flat screen TV of up to 43.5 inches and it will support up to 85 lbs People will compliment you on your choice of fireplace. The Windsor fireplace comes is a good-looking fireplace coming in your choice of 2 finishes, the model # ending in PC81 is the cherry finish, and the model # ending in PE91 is the oak espresso. finish. Better yet, it comes with a ClassicFlame 23II310GRA infrared electric firpelace insert. ClassicFlame is a large producer of electric fireplaces and electric fireplace inserts and is known for great technology. The maximum load for the top is 45 pounds which will accommodate most current flat screen tv sizes up to 55″ depending actual weight. Classic Flame is known for their colorful flame effects. SpectraFire technology lets you customize the appearance of the flame. Spectrafire Plus customizable flame effect: 5 flame effects, 5 flame speeds, 5 brightness settings = 125 different combinations. The manufacturer states “Infrared Quartz heater warms up to 1,000 square feet”. As with all electric fireplaces it should be noted that the heating capacity acts as supplemental heat not necessarily primary heat especially an open concept rooms such as living rooms. this unit plugs into any standard 120 V outlet, has a nine hour auto shutoff timer and “safety plug of fire prevention technology”, which is basically a safety shutoff switch built in the plug. We really like the classic flame electric fireplaces with her Spectra fire technology.it may be a bit of a bias but our fascination with electric fireplaces is about creating ambience, mood in coziness. The incredible ability to adjust the flames in so many different ways is right up our alley. This unit goes beyond the standard effective trying to imitate real fire and puts a little pizzazz into it. it appears that orders for this fireplace are being fulfilled through Amazon by outside suppliers make sure you are getting the ClassicFlame 23II310GRA infrared electric fireplace insert as part of the deal. We recommend looking for Electric Fireplaces Direct to fulfill your order. The Churchill corner electric fireplaces is available in 2 finishes – dark espresso 3750E-DE and as an oak corner electric fireplace entertainment center 3750E-O. There is plenty of room for the cable box and DVD player, as well as room for books and small items. It is constructed with both solid wood and veneered MDF construction the shelf dimensions are 12.5″ x 8.25″. It will work with the TV up to 50 inches wide and support a 100 pound weight limit. It has a 90 day limited warranty on the mantle, and a one-year limited warranty on the firebox itself. The flame effects on this fireplace are going for realism. The real control you have on the flame is dimming and brightness rather than changing colors (as on the Classic Flame). Real flame’s patented flame technology with dynamic ember effect, creates one of the most realistic electric fireplaces available today. The flame effect can operate without the heat. The heater is rated at 1400 watts and 4700 BTU’s per hour. This is slightly below maximum for electric fireplace heaters (1500 W, 5200 BTU). It’s performance is average for electric fireplaces. Some people think it does a good job and others are disappointed. It depends on your expectations. In terms of customer satisfaction, this fireplace rated 4.2 stars out of 5 on Amazon as of this writing. 2 of the really low scoring reviews were due to shipping damage. If you are leaning more toward style of furniture, this may be a good choice. The firebox and flame effects are average to good and the heater average. No real knocks against this unit, but nothing really lights our fire. This is another electric fireplace manufactured by SEI – Southern Enterprise Inc, which is primarily a furniture maker. That furniture aspect is reflected in how good looking this unit is. Be aware that a couple of buyers stated the color is more off-white than they expected. The realistic flame and glowing embers are powered by energy efficient LED’s which are very long lasting and need no replacement. The burning logs can be adjusted for brightness and the height of the flickering flames can also be adjusted. The tempered glass at the front of the firebox is safe and always cool to the touch so if you have young children or pets there is no need to be concerned. The flame effects can be used independently of the heater which means that whatever the weather you can enjoy them. The heater specifications for this unit are average to slightly above average for electric fireplaces. It provides 1500 Watts 5000 BTUs and draws 12.5 A This electric fireplace has an adjustable thermostat with timer be set in increments of 4° from 62° to 82°. This does not necessarily mean it can heater room to those temperatures. The manufacturer claims supplemental heat for up to 400 ft.² there is a thermal safety overload protector. This fireplace rated four out of five stars. One common complaint and the most frequently cited was that the pictures do not accurately depict the color of the fireplace. People stated it was slightly darker in yellow or than the advertised ivory color. As far as functionality of the heater and the flame effects go everyone was very satisfied. This fireplace is stylish and provides excellent features for media storage. It is good value for money and the flame effects are pretty realistic.